Spring often seems like a chain reaction—sort of like that joke: April showers bring May flowers, and what do Mayflowers bring? The first domino is the herring swimming upstream. The herring are swimming upstream to spawn, but they’re also a food source for other animals, so others follow: underwater, the striped bass feed on the herring. And at the water’s surface, there are osprey. One osprey might not make a springtime, but soon there are a couple, and then more. We see their pale bellies in the sky, or perched in the trees. We see them along the herring runs. I saw one yesterday when I was driving on the highway. Now that the osprey are back, they’re back in force. And it’s good to see them, not least because osprey were one of the species impacted by DDT in the 1950s, 60s, and 70s. Since the first national survey of osprey in 1981, when 8,000 pairs of birds were found, the population has increased significantly: 2001’s survey found 19,000 pairs. 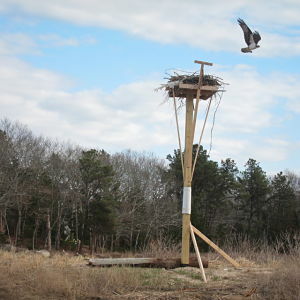 Scientific research attributes this increase in osprey, not just to the ban of DDT, but to the efforts of people to support the birds through nest platforms like those that are ubiquitous along our salt marshes, for example. 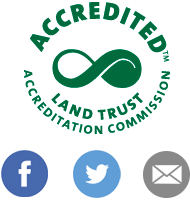 Lori Benson, a Wareham Land Trust board member, checks in one the nest platforms near her home regularly. Lori was involved with the installation of some of Onset’s nest platforms, but mostly she just likes to see the birds and how they’re doing. 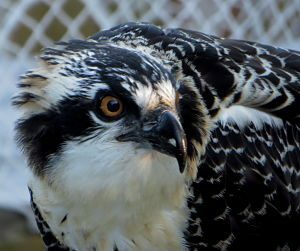 Ospreys charm almost effortlessly: on a school program with Minot Forest Elementary, we spotted an osprey circling above a pond. As it flew off we discussed what we had seen, and a group who had identified the bird variously as a falcon and a seagull suddenly had a new favorite bird. And even the individuals we see seem a bit cosmopolitan, don’t they? They are returning to us from winters spent as far south as Argentina, ready to build their nests on our shores. Young osprey will actually stay in the south rather than migrating north during their first year of life—and by the time you see osprey on an egg producing nest, they’re at least three years old. Because osprey are so widespread, it’s been suggested that they should be a ‘Worldwide Sentinel Species’: species that, like canaries in a coalmine, help us to monitor potential hazards in the environment. We can compare how osprey are doing from here to Australia, and learn from them. And because osprey are so widespread, I can tell you stories like this: Albertus Magnus (Catholic saint, German friar) believed that osprey had one webbed foot and one taloned foot. Pliny the Elder believed osprey young flew to the sun as a test. It was a medieval believe that osprey didn’t really catch fish, the fish just turned belly-up and surrendered. So next time you spot an osprey, take a moment to think: they’ve traveled so far to return to our shores for the spring and the summer. And, around the world, other birds just like the ones we see here are doing the same things: returning to the shores, building nests, catching fish. Our cosmopolitan neighbors.